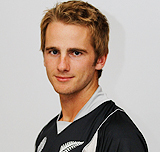 CricketGeek: Where does Kane Williamson sit? Where does Kane Williamson sit? The first time I met Brendon McCullum was when he and I were both on the same flight from Miami to St Kitts in 2012, and we both had to wait about 2 hours in for our flight. I introduced myself to him, and he graciously put down his golf magazine and chatted to me for about 30 minutes. After the flight, while we were both waiting for our bags (which took forever), he found out that we were staying at the same hotel, and so he offered me a lift there, provided I didn't mind going via the training ground. On the way to the ground, he got a phone call from John Wright asking if he was likely to be able to play the next day. At this point he had been travelling for 37 hours, without much sleep, and certainly did not look like he was going to be good to play. He said as much to Wright and then found out that Taylor was injured, and Kane Williamson was going to be standing in as captain. After he hung up, McCullum couldn't contain his disappointment with that decision. He said something along the lines of "it's not that he's not capable of leading the side, it's more that he's not established in the side yet, and he's still learning his game. He doesn't need the pressure of being the captain-in-waiting to go with it. The kid is so good. He's either going to be the best batsman we've produced since Martin Crowe, or the best batsman we've ever produced, and it's our job to manage him properly to allow him to be great." Williamson scored 9 off 17, but New Zealand went on to win the match, due largely to a good spell from Southee and Oram, and some suicidal running between wickets from the West Indies. However the claim that Williamson could be our best ever batsman has stuck with me. Yesterday he completed an epic (but certainly not chanceless) innings of 242* to take New Zealand from a position of some trouble to a being in the box seat. Since my conversation with McCullum, Williamson has gone on to be quite impressive with the bat. In the past 2 and a half years he has averaged 50.28 in tests and 49.25 in ODI's. In the matches before McCullum's pronouncement he had averaged 36.05 in tests and 35.75 at a strike rate of 83.85 in ODI's. There is an important omission here, JF Reid only just missed out on this table, as he only played 19 tests, for an average of 46 and centuries per completed inning of 4.67. However I decided to make the cut off 20 tests to allow for diversity in conditions, and a sufficient sample size, and then noticed that Reid had missed out after that. Ranked by completed innings per hundred, Crowe is still slightly ahead of Williamson, but if we look at the time since my conversation with McCullum his conversion rate has come down closer to 6.5. Sometimes it can be dangerous to look at a players's career based on their final average. One of the all time greats in my mind was Sir Frank Worrell who averaged 61 before his 30th birthday, but then he was convinced to come back as a specialist captain, and he averaged 41 after that. As a result it can be better to look at batsmen at the same stage of their careers. Again we see Williamson at the top. However, this time it is not so clear. If he had been dismissed for 30 instead of 242* in his last innings, he would have been on 2822 runs and his average would have been 42.12 which would have put him 5th in the list on both counts. A better picture might be to look at a graph of the career progression around that mark. We can see the impact of the last innings, but we can also see that there is a trend here that this innings was just a part of. It is still too early to say that Williamson is our best batsman since Crowe, let alone that he is our best ever, but he is certainly in the conversation.